My college Freshman year started soon after camp ended. At the close of camp PK said, “Let’s be friends.” I believed it; quite possibly, he believed it too. I tried calling and writing (real letters with doodles and stuff). It seemed PK didn’t want to be friends. He never responded. Now, having more wisdom from experience, he was either A) Busy being a high school senior or B) Didn’t want the commitment of long-distance friendship so ignoring me was easier. No matter how many times you’ve done it, rationalizing yourself out of heartbreak does not come easy. I spent the first half of freshman year mourning the breakup of my first relationship. To my new friends, my stories would often begin, “One time at Church Camp…” (1) During camp, I was able to shake off my “awkward girl” inner monologue and be at home in my soul. I always left camp with more self-confidence than when I arrived. Naturally, I was excited to be accepted on staff for another summer. After seeing pictures from the Winter Formal, I realized I had over-achieved and gained the Freshman 15 + 5. Oh crap! I was twisted with my weight-loss incentives: Get back together with PK or make him jealous. Extreme measures must be taken and I did the unthinkable. I stopped eating cheesecake! I also cut my coffee consumption (a bigger sacrifice than giving up cheesecake). Coffee, which included milk and two rounded teaspoons of sugar, went from two 10 oz cups in the morning and two 10 oz cups in the afternoon and maybe more during Sociology (one 16 oz cup) to 1 cup in the morning and one in the afternoon, each with 1 level teaspoon of sugar and less milk. 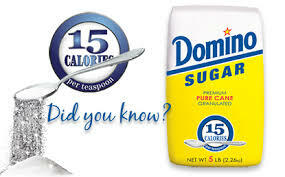 I was consuming 45+ calories in sugar alone for each cup of coffee, resulting in a daily tally of 225+ sugar calroies. My second afternoon cup was replaced by an hour of aerobics. I did not look like this. For campus dining, I carefully selected meals that looked less greasy, cut portion sizes and skipped dessert (most of the time). 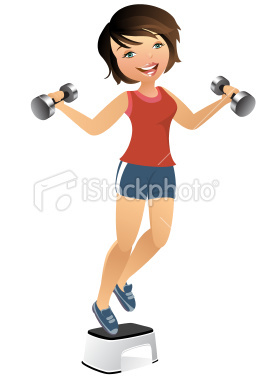 Sometimes, my evenings were capped off with more workouts. I lost 2 dress sizes! At camp, I was a baker again. Since my co-baker spent the previous summer mostly sick, management gave me the opportunity to run the bakery on my own and be the sole baker at the age of 20. PK was the camp photographer (working Up The Hill) and there was a new batch of Camp Family. 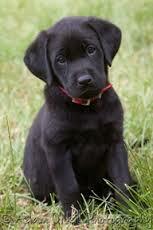 While flattered by the advances and attention, I’m hetero and again, he was like a giant puppy. Besides, my eyes were other places. PK did not care we were Up The Hill together. I looked better than I did when we “dated,” but it was as if the previous summer didn’t happen. Despite PK’s aloofness, camp, as it always did, bolstered my confidence, anchored my faith, and with the safety of co-workers, helped me sharpen my flirting skills that were butter knife dull. It was a friend from my Camp Family summer I took to prom after I turned Red down. The following summer I dated PK. 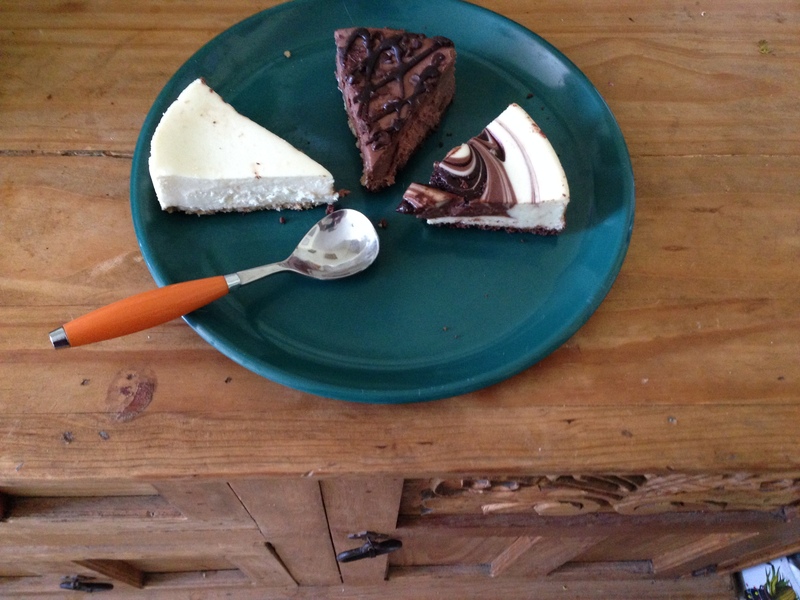 This summer, my third summer on staff, with cheesecake weight lost, ANYTHING COULD HAPPEN! 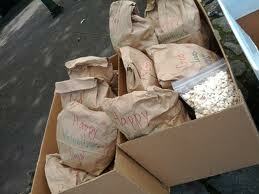 In addition to baking, I made brown bag lunches for campers to take on their hiking or cycling trips. English Teacher was Deaning (leading) a Cycling Conference. He was on staff for many summers before my Family Summer; he had a camp legacy. (He couldn’t have been more than 25.) My Family summer he’d volunteer and visit his camp girlfriend. (Their relationship lasted longer than a summer.) Of course I knew who he was, but I was surprised when I found out he knew who I was. I had dutifully prepared the brown bag lunches so English Teacher and his campers could go cycling after Monday’s breakfast. It was then he approached me to discuss provisions. He was going to be an English teacher and I was majoring in English. He used to work at camp and I currently worked there. (And, we both breathe air!) We had so much in common! My heart needed to talk to him more and throughout the week I made sure we did. I invited him to stay for Saturday dinner. (Saturday dinners were traditionally fancier since it was only the summer staff and the incoming Deans and counselors for the week.) I intended to use dessert as my bait. I was terrified. I could be marginally flirty and confident, but I couldn’t manage a visit. I stayed in the female dorm. The next day he chastised me for not visiting. He had a lot of friends on staff, so he was often up visiting or volunteering. We kept re-connecting. No kissing. No holding hands. Just talking. I’ve often wondered what would have happened if I went for that Friday night visit. Maybe something, probably nothing. I still have good memories of that summer and our small exchanges and how I felt when I was able to entice him to stay for dessert. You can make your own graham cracker crumb crust for this, or if you’re pressed for time, you can purchase a store-bought pie crust. 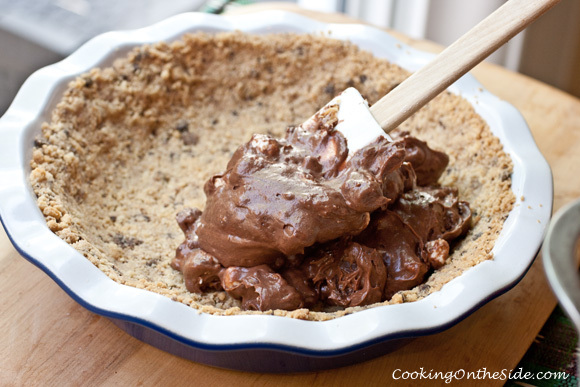 Still use the plain graham cracker crust; that way you have a flavor contrast to the chocolate in the pie filling. Set oven rack on bottom slot. In a bowl combine the gram cracker crumbs, butter and ¼ cup peanut butter. Mix thoroughly. Press the mixture into the bottom of a 9-inch spring-form pan. BAKE until golden and crisp, (6 to 8 minutes). Using an electric mixer (if you have one), or a wooden spoon (if you don’t) beat the cream cheese with sugar until smooth. Add the remaining ¾ cup peanut butter. Beat until smooth. Add the milk and roasted peanuts and beat well. In a separate bowl whip the heavy cream. When it has light peaks, add the confectioner’s sugar. Fold 4 cups of the whipped cream into the peanut butter mixture. Cover with plastic wrap and refrigerate until firm, (about 2 hours). Remove from the refrigerator just before serving. Pool your chocolate sauce on plates. Cut and plate pie slices. Garnish with whipped cream, chopped peanuts, chocolate shaving. When whipping the cream, wait until it has soft peaks add confectioner’s sugar and lightly sweeten… one to two tablespoons. Yes, I’m nerding out and using endnotes. 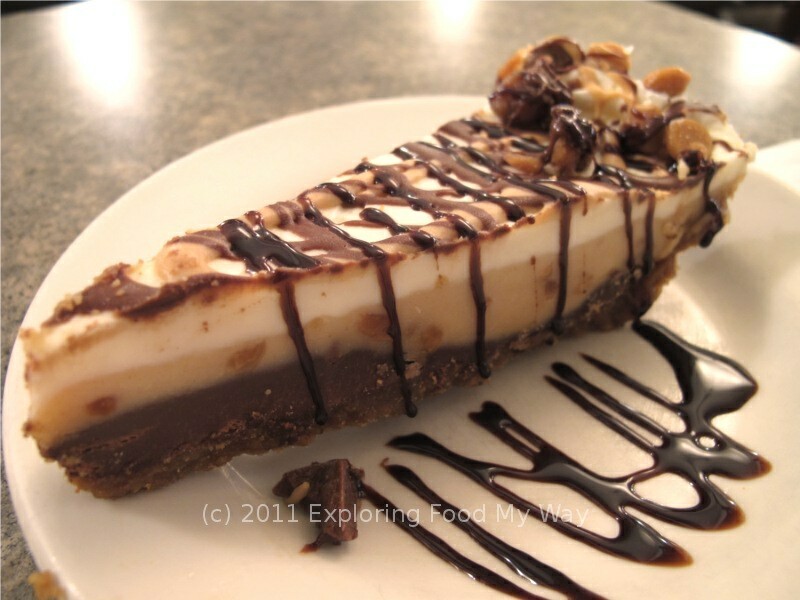 This entry was posted in Dessert, Pie and tagged Camp Family, chocolate, Chocolate Peanut Butter Cream Pie, Church Camp, Cream Pie, Emeril Lagasse, English Teacher, peanut butter, Pi Day, PK, red. Bookmark the permalink. Thoughts on dance, life, and being better at both.